Above left: 14/620 Sgt. 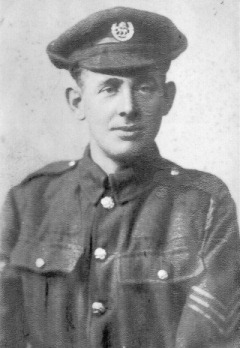 Fred Lindley, killed in action on 7th May 1917. Fred voluntarily enlisted into the 14th York & Lancs. (2nd Barnsley Pals) in January 1915. At the time of his enlistment, Fred, a 32-year old colliery worker, was living with his wife Lena and their two sons, 6-year old Ronald and 2-year old Walter, at Spark Lane, Mapplewell. Photograph by kind courtesy of Fred's great-granddaughter, Ruth Sen. Above right: 14/1325 Pte. William Henry Dyson. William survived the war, serving afterwards in both Mesopotamia and North West Persia with the 2nd York & Lancs. Photograph by kind courtesy of William's grandson, Syd Dyson. The full story of the 1st and 2nd Barnsley Pals is told in Jon Cooksey's excellent "Barnsley Pals", published by Pen & Sword Books. Biographical notes on those named on the war memorial at Hoyland near Barnsley, researched by Peter Marsden. 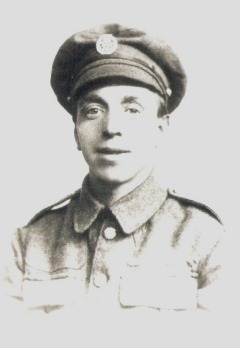 Peter's grandfather Joseph Marsden was killed in action with the 1st Barnsley Pals on 11th April 1918.